Extreame Savings Item! Save 45% on the Honeywell True HEPA Air Purifier Replacement Filter 2 Pack HRF-H2 / Filter (H) by Honeywell at PBD Trio. MPN: HRF-H2. Hurry! Limited time offer. Offer valid only while supplies last. 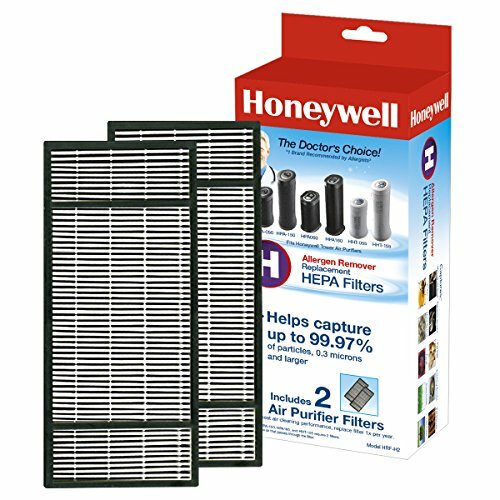 CERTIFIED HEPA FILTER FOR HONEYWELL AIR PURIFIERS: Our Filter H HEPA filters help capture up to 99.97% of airborne particles as small as 0.3 micron & fit HPA060, HPA160, HPA050, HPA150, HHT055, HHT155 series. Replace filters yearly for best performance. HONEYWELL AIR PURIFIERS: Use Certified HEPA filters in air purifier to remove allergens, dust & other particles from your air. If you have allergies or pets, air purifiers do more than freshen air, helping remove airborne particles & improve air quality.